Sometimes when a filmmaker makes something so drenched in its artistic style, it can often result in something so bonkers and entertainingly bizarre that you kind of admire it despite yourself. In this instance, it’s Nicolas Winding Refn who matches this description as he brings forth his latest descent into auteur madness, The Neon Demon – but after something much more solid and crowd-pleasing like Drive and something so alienating and abstract like Only God Forgives, is the Danish filmmaker’s newest film just another exercise in style over substance? Yes, it is, but not in the way you might be thinking. In this film’s case, the style IS the substance – it is beautiful to look at, sometimes unlike anything you’ve really seen before, but underneath is something a little more vapid and hollow, obsessed with only its good looks and ageless physiques. Appropriate, then, for a film about stick-thin female models. The film follows Jesse (Elle Fanning), a 16-year-old girl who travels to LA looking to pursue a modelling career, and manages to get her foot in the door thanks to her youthful looks and “deer in the headlights” posture. Everyone around her, including older models Gigi (Bella Heathcote) and Sarah (Abbey Lee), make-up artist Ruby (Jena Malone), a casting director played by a cameoing Christina Hendricks – who instructs her to tell everyone she’s 19, as opposed to 18 which is “a little on the nose” – and a slightly pervy fashion designer (Alessandro Nivola) all sense something special about Jesse, and whatever it is they want it for themselves. How they get what they want we won’t dare give away here, because part of the fun is in seeing how it all plays out, but for now we’ll say it’s easy to see why this movie got a mixed reception at Cannes. However, for our money, we couldn’t help but find ourselves completely enraptured by this film, even at its most bonkers. Everything in this movie from the cinematography to the sets to the delivering of dialogue is nothing short of hypnotizing, and Refn is clearly in his element as he invites us to go further down the rabbit hole and take a peek at some of the other displays of subtle madness. Say whatever you want about his more obscure films like Only God Forgives or Valhalla Rising, but much like Jesse in this film they all have that special something in a style that is unmistakably Refn’s, one that presents a surreal and almost dream-like atmosphere that also happens to contain the strange and other-worldly qualities one would expect from a trip to the subconscious, in this case through something much more nightmarish. It definitely helps make the film stand out at least from a visual point of view, something that cinematographer Natasha Braier contributes to vividly with haunting and intense imagery that takes advantage of its screen presence and paints several pictures of chilling, sublimely subtle horror. Funnily enough, it’s billed as a horror film, but The Neon Demon doesn’t really possess many of the traditional genre tropes (thank goodness), making it a horror film in the same way that Dario Argento’s Suspiria or Tomas Alfredson’s Let The Right One In were; it’s more pretty to look at than it is truly scary. That’s not to say, however, that it’s completely devoid of disturbing and incredibly sinister stuff – for instance, an early session with an intense photographer (a stick-thin Desmond Harrington, who ironically here looks like the kind of serial killer he was trying to capture on Dexter) requires young Jesse to strip naked while he rubs golden paint all over her body for a photoshoot, and because he’s such an intense guy when we meet him we have no idea what the hell he’s going to do to her at any moment, leaving us with an uncomfortable feeling of suspense all throughout that scene. Later on, we see the high-strung manager of the motel Jesse is staying in (Keanu Reeves, in an all-too-brief against-type role) sneaking in to her room one evening and forcing her to swallow a knife, which is already messed up but as before Reeves is playing such an unlikable and rather frightening figure that the scene plays out even more chillingly since we have no idea what this guy really has on his mind while he’s doing this. Don’t even get us started on what goes on in a morgue, where Malone’s Ruby works part-time. Seriously, don’t. It’s not perfect by any means, and while Refn’s emphasis on style over substance fits perfectly with the subject material it can be a little distracting when it’s trying to tell parts of whatever kind of story it’s trying to tell. This causes many scenes and threads to go absolutely nowhere, like a small bond that Jesse forms with a kindly photographer named Dean (Karl Glusman), or a scene where out of nowhere a jungle cat invades her motel room with no explanation or follow-up; both of these, and a few others, seem to only be there so that Refn can give us more pretty imagery than actually tell more of a coherent story. Without giving anything away, it also ends on a slightly dissatisfying note – a lot of it is just as bonkers as what came before, but when you take into account almost everything that’s been established, the ending makes it all seem rather pointless. 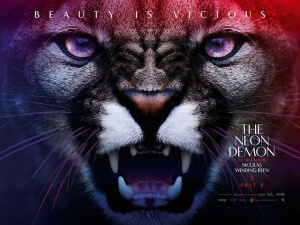 It’s flawed, it’s self-indulgent, it’s pretty to a fault – it’s undeniably a Nicolas Winding Refn film, and against our better judgement that’s kind of why we liked The Neon Demon so much. We honestly wouldn’t have it any other way. The Neon Demon is a hypnotically entertaining new addition to Nicolas Winding Refn’s bizarre but undeniably fascinating filmography, combining beautiful cinematography with some bonkers-but-fun imagery that all but covers up its more obvious flaws, which we don’t mind because we’re having so much fun watching the insanity of it all.